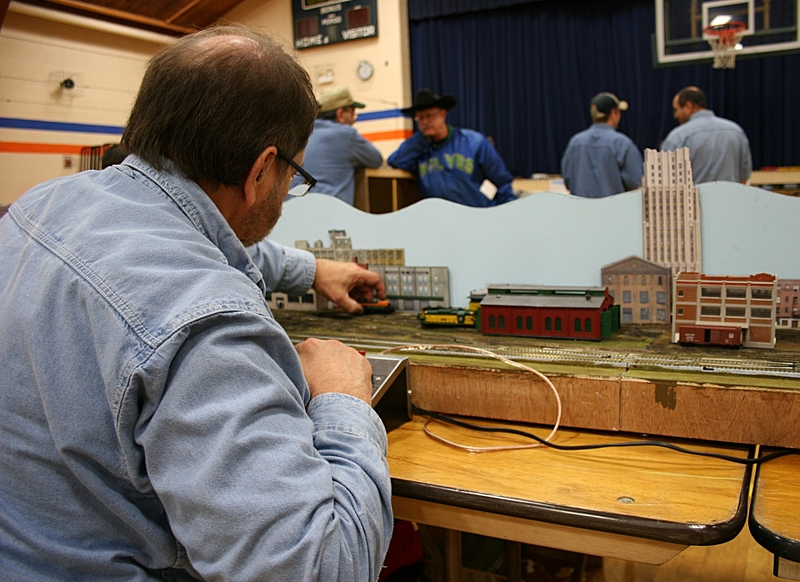 Railroad enthusiasts displayed their trains in the Randolph School gym Saturday. One participant told me he enjoys the social aspect of these gatherings. 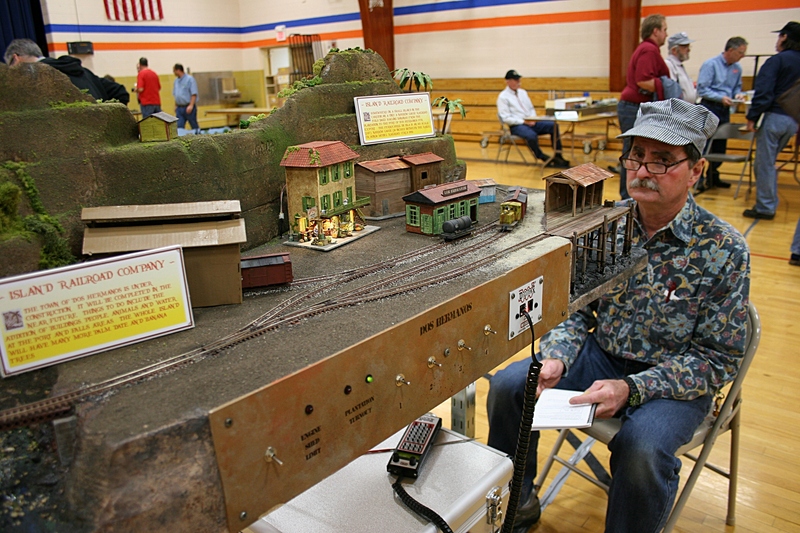 Last year he went to train shows on 16 weekends. I WAS DEFINITELY out of my element on Saturday poking through two gyms packed with all things railroad at the annual Randolph Railroad Days. 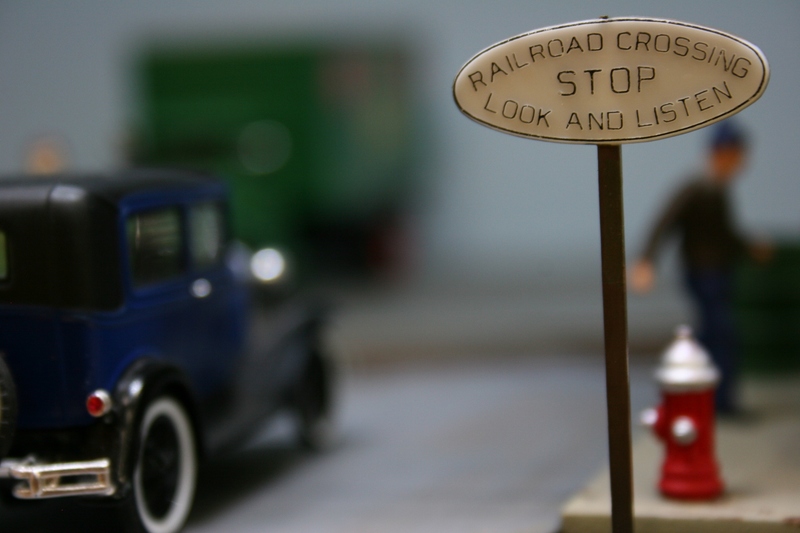 You might even say I was overwhelmed by the sheer volume and variety of railroad-related merchandise vendors were selling and by the train set-ups hobbyists were displaying. I tried to meander on my own, unnoticed, no easy task when you’re sporting a DSLR camera and occasionally crawling on the floor. People tend to notice. “Just pretend I’m not here,” I told at least one teen (or pre-teen), who scooted out of my viewfinder range when he spotted me aiming the lens his direction. I managed to snap this photo after telling this trio to ignore me and my camera. As for the younger elementary-aged boys, I found keeping up with them as they darted from one train model to the next an impossible pursuit. 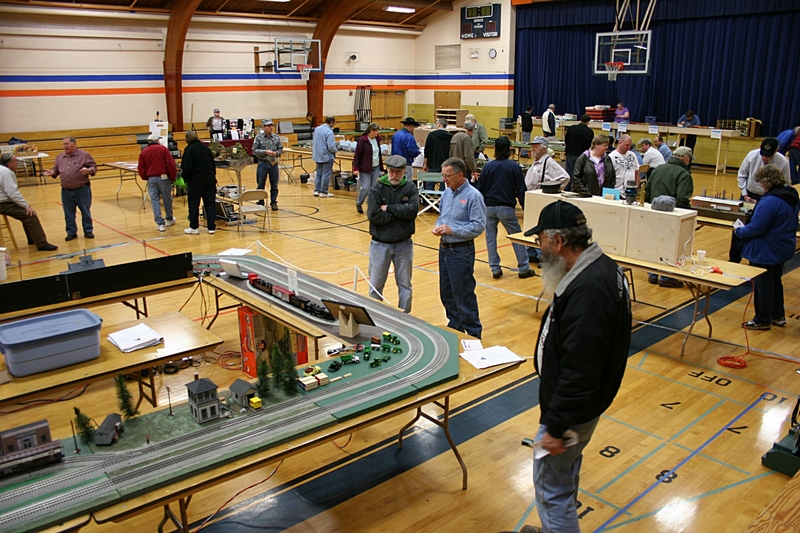 The middle-aged men seemed mostly interested in engaging me in conversation about the details of model railroading. I decided beforehand that I wasn’t taking notes and that my attendance at this event would be more about my observations and about having fun and not about learning the intricacies of this hobby. 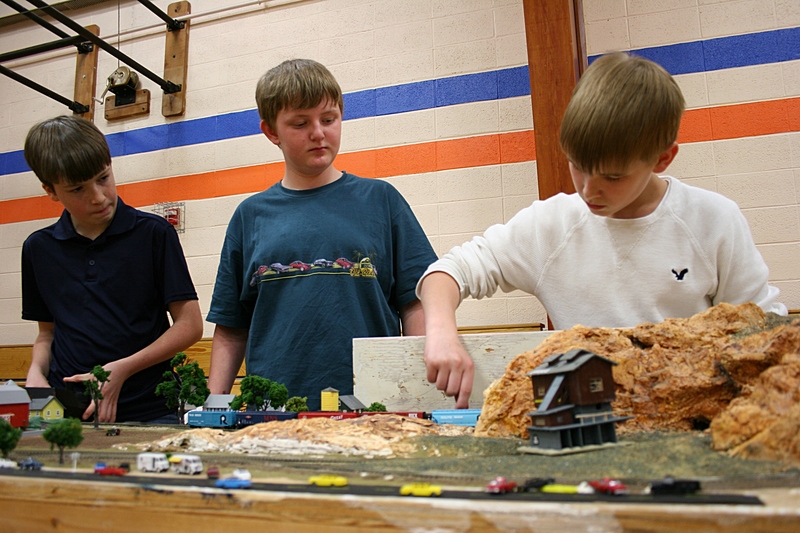 Like engineers, most participants tend their trains. However, I witnessed a small fire, at an unattended table, when a wire shorted. I did not respond quickly enough to either extinguish the flames or take a photo. As you can see by the blurred train, these trains speed around the tracks. I judged this "banana train" display as the most creative with mountains and waterfalls in a tropical South American setting. I wanted to hop on board. The waterfalls are on the other side of the mountains. Here’s what I concluded: No matter your age, there’s something magical and mesmerizing about watching toy trains travel a track. 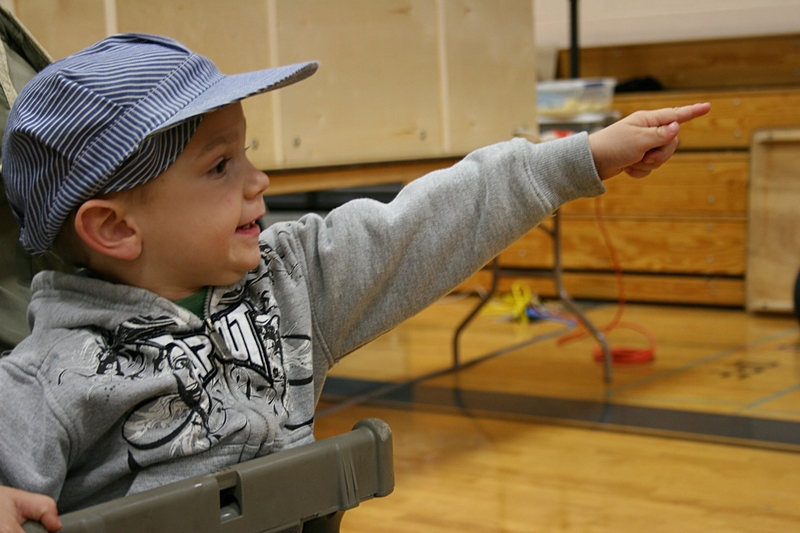 Two-year-old Eli, confined to his stroller, points to trains circling a track. Eli was pointing to this train set-up being photographed by another railroad enthusiast with his cell phone. The details in the train displays impressed me. One engineer asked if I saw a cat sitting on a fence outside a barn. I couldn't find it. Then he pointed to a cat so tiny I wished I had a magnifying glass. 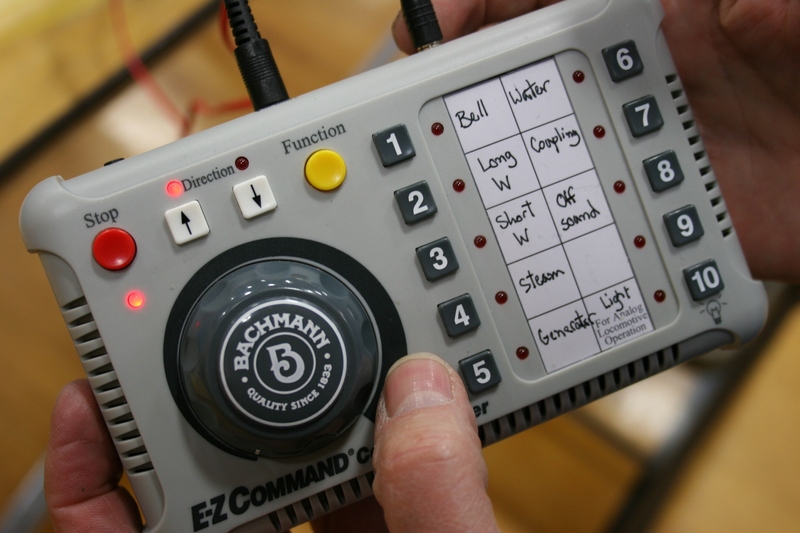 Railroad enthusiast Jim from Northfield demonstrated the sounds, etc., that he can control on his train with the simple push of a button. Amazing. These matching signs made me chuckle. 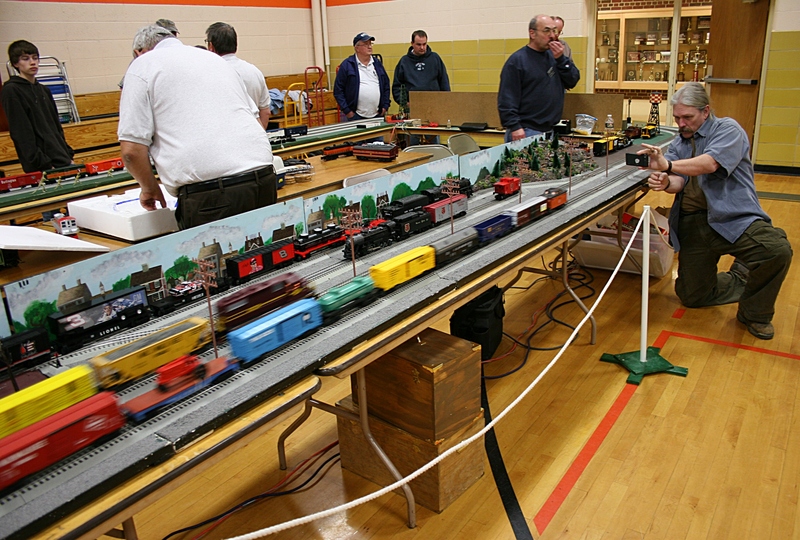 WHAT PULLS YOUNG and old alike to thrill in model trains? Check back for photos from the Randolph Railroad Days swap meet. Love it! 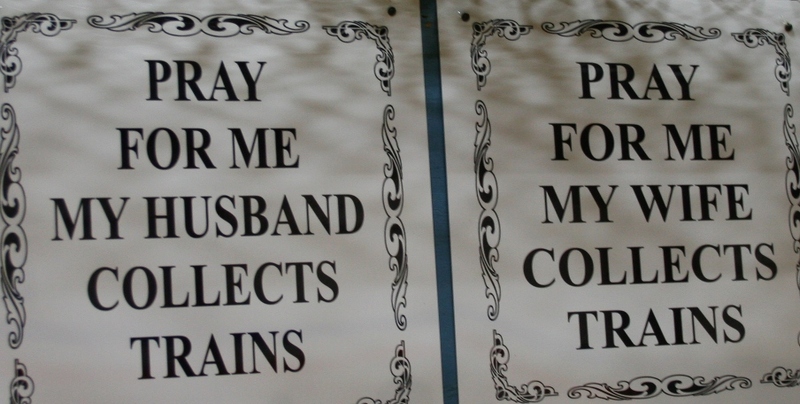 Trains are wonderful – my husband would have enjoyed the show! We have my father’s LGB train – from Germany when we lived there. It’s so fun!!! Trains appeal to all ages, it seems. I remember when my son was fascinated by trains and had a wonderful wooden train set. He played with it all the time as a preschooler. I’ll have more photos coming, from the swap meet part of the Randolph event. 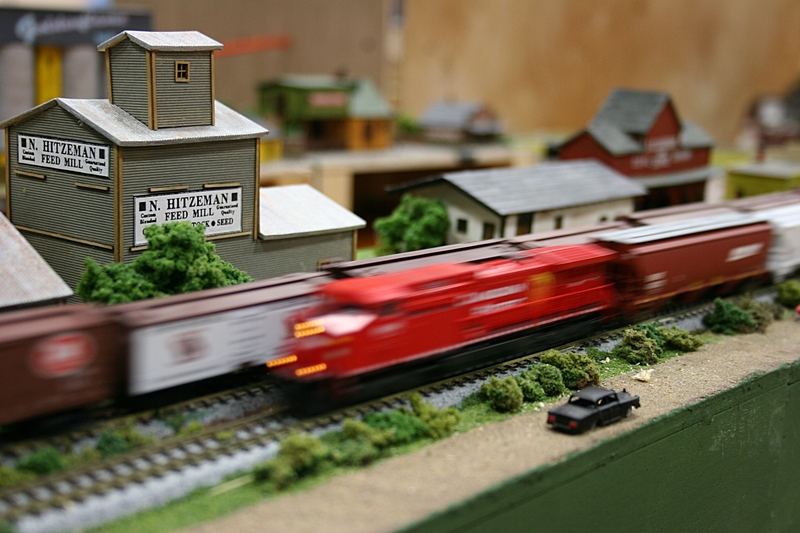 The Randolph Railroad Days train show date for 2016 is April 9th and 10th. The date will always vary because of Easter. Thanks for that info, Gordy.